Founded in January 2000, the Center for Social Well Being is a non-profit organization dedicated to the enhancement of citizen participation to improve the lives and opportunities of children, youth and adults in Andean communities in Peru. The organization works to sensitize students and visitors to the region to global and local issues they can actively take part in to contribute to the development of mutual respect required for a just society. They offer a 3 week intensive internship training program after which students may work and/or pursue their own research objectives in health,education, agricultural, social development, municipal institutes, or with civic organizations, depending on acquired skills, demonstrated abilities and interests. Length of the post-training internship is adapted to students’ needs with respect to academic and professional requirements (usually extends from 2 to 10 months). Upon successful completion of the seminar, students formally affiliate with the Center for Social Being as researchers and outreach workers. 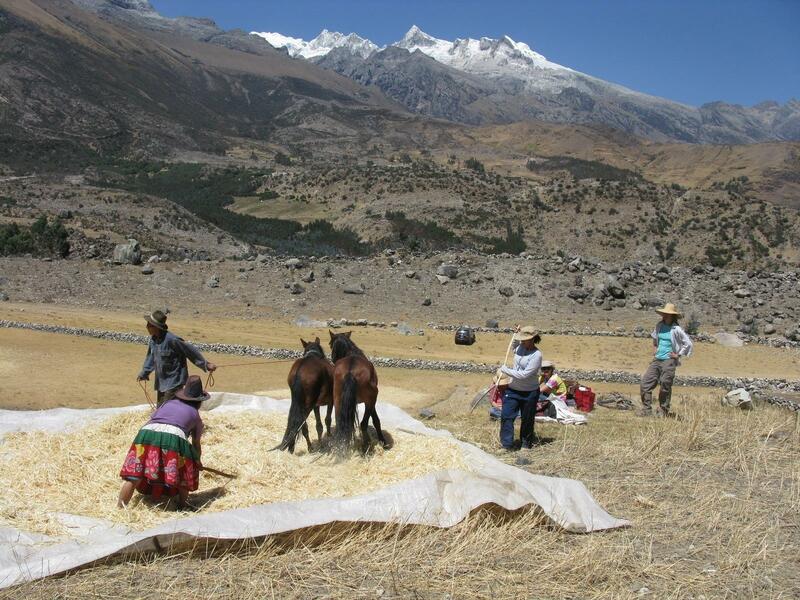 Training consists of an interdisciplinary qualitative field methods seminar, which includes language classes (Spanish and Quechua) in the Peruvian Andes. The combined undergraduate and graduate level course is held at the center's rural base, an adobe lodge on an ecological ranch in the Cordillera Blanca mountain range of the Callejón de Huaylas, 7 hours northeast of Lima. Coursework provides in-depth orientation to theory and practice infield investigation that emphasizes methods in Participatory Action Research and Andean Ethnography centered on themes of Climate Change with respect to Ecology, Health, Education, Social Justice, Agrobiodiversity, Community Organization and related topics. Students have the opportunity to actively engage in ongoing projects and programs in local agricultural communities to develop effective interactive field abilities and required language skills to later be placed in appropriate community programs and projects. In addition, the training seminar provides excursions to museums, archaeological sites, glacial lakes and hot springs; optional recreational activities include hiking, mountain biking, rafting, kayaking, rock climbing and trekking. The training program tuition includes all in-country travel, food and accommodations at the rural center, and course materials. The program is under the direction of Applied Medical Anthropologist, Patricia J. Hammer, Ph.D., and Flor de María Barreto Tosi, Ecologist and Field Coordinator, as well as Isabella Chan, MPH. Applicants must complete and return the program application that will be submitted CICD's partner.